Situated in the Greater Toronto Area, Keswick is a close nit community full of pride! After becoming part of the Township of Georgina, this welcoming town continues to expand. Keswick is best known for swimming, boating, ice fishing, snowmobiling and many other fun activities that the community takes part in. With so much to do, it's important the residents of Keswick prepare their vechicles for the outdoor adventures ahead. Jiffy Lube Keswick, located at 24795 Woodbine Ave, takes pride in ensuring customers leave knowing their vehicles have been adequately prepped for the many road trips ahead. Our friendly staff are here to provide top-notch vehicle maintenance and friendly customer service, all with no appointment needed! Come visit Jiffy Lube Keswick for service you can trust and results you can depend on. Oil is the lifeblood of your vehicle. When you come to Jiffy Lube® for your oil change, we’ll determine which type of motor oil is best for your engine based on recommendations from your vehicle’s owners manual. Plus – get free oil top ups in-between oil changes as needed! Oil change champions – it’s what we’ve been known as since 1979. Since then, we’ve hit many milestones we’re proud of. We created the service reminder sticker on your windshield, introduced the first drive-thru service bay, and grew to over 50 Ontario locations to serve you better. In the spirit of growth, progression and innovation, Jiffy Lube® stores have also expanded their service offering over the years to provide customers with more preventive vehicle maintenance in one convenient location. Need a new pair of wiper blades after a tough winter? Does your battery need to be replaced? Do it all at Jiffy Lube®! Come in and experience fast and no-appointment service no matter what maintenance your vehicle needs! The Jiffy Lube Gift Card is a great choice for giving to family and friends, or keeping for yourself! Vehicle Maintenance, Driving Safety, Handy Hacks & More! 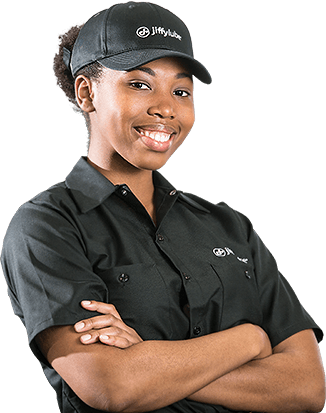 At Jiffy Lube, our team is built from personality and passion. We are always interested in having people join us that share our mindset of going above and beyond, and that will work to maintain more than just cars, but relationships. If you believe you have the charisma that will cause a customer to return, and the kind of warm attitude that makes everyone feel welcome to drive on in, we want to hear from you! We're always looking for people to join our talented team. For instructions on how to apply online or in-store, please	visit our Careers Page.